The NIH Cancer Nanotechnology Platform Partnership Program at the University of Kentucky focuses on developing RNA nanotechnology for advanced cancer therapeutics. A variety of RNA nanoparticles, of which both the scaffold and therapeutic reagents are RNA molecules, have been created. This image shows ultra-stable RNA nanoparticles (red color) that have resourceful functionalities. They can self-assemble from RNA fragments carrying therapeutic RNAs and receptor targeting RNA aptamers. Systemic injection revealed that the nanoparticles specifically target to cancer cells (Green: cytoskeleton. 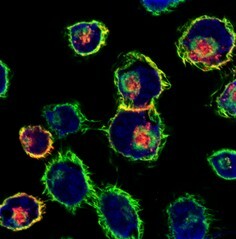 Red: Fluorescent pRNA nanoparticle. Blue: Nuclei.) without entering healthy tissue or accumulating in normal organs (Nature Nanotechnology 2011, 6:658; Nano Today 2012, 7:245, Nature Protocols 2013, 8:1635). This image is part of the Nanotechnology Image Library collection.